As discussed in my last post, the real Siege of Newcastle makes an uncomfortable basis for a game, since it was really two separate events with a sort of extended hangover period between. I have now produced a fudged version of the history, which gives a better excuse to stage a proper siege. The scenario is now some weeks earlier than the real event, and the garrison of Newcastle seems to have been augmented by some returning veteran troops who, in complete defiance of accepted history, did not fight to the last man at Marston Moor, but marched off back home at the first opportunity, just squeaking over the bridge into the town before the Scots captured Gateshead and slammed the - erm - gate. To get round the further issue that the Scots' best strategy appears now to be to wait and starve the town into submission, I've also applied some political and contextual reasons for them to have to get on with taking the place. I think it will be all right. The game will take place on Wednesday - I shall have one guest general taking the part of the besieged, the other the besiegers, and I shall be the umpire. That may sound nastily as though I will actually play a solo game, with two slaves to help, but I shall take care to ensure it doesn't work like that. The three of us will - collectively - play through our version of the Siege of Newcastle - if it turns out that the town never stood a chance then the process should at least be educational. If it turns out that the rules don't hang together very well then we can agree to patch them on the fly. It's all in an excellent cause. And there will, of course, be some supper. I've managed to reduce my multiple attempts at siege rules (9 years of false starts, plus numerous manuscript scribbles - some actually jotted down while away on holiday) to a single typed document - well, all right, a mature draft - I still have a little time to check to see if some of the numbers need to be altered to give a balanced game. I have also produced three documents, to set the context for our game. I have one each for the two commanders, telling them what they, personally, need to know, and I have a general preamble, which I shall include here, which sets out the (amended) historical situation in terms which are common knowledge - stuff which can be freely shared. Here goes - this is the first handout - both commanders get this as a starter. It is 8am on Monday 3rd October 1644. It is a dreary, cold morning – blustery, with the threat of rain later. The scene is the area outside the walls on the northern side of Newcastle upon Tyne, an important coal and commercial centre with a population of about 11,000. 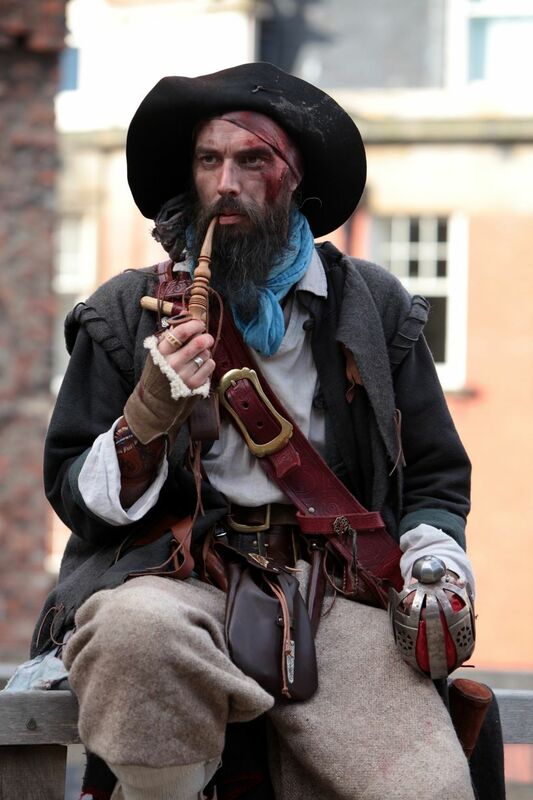 Newcastle has been loyally supportive of King Charles throughout the first two years of the Civil War. 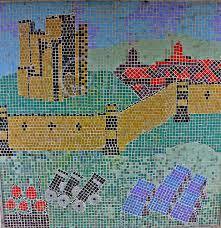 It is a bleak landscape – not enhanced by the presence of many small, abandoned coal workings and the burned-out ruins of some humble suburbs that had grown up outside the town’s Newgate and Pilgrim Street Gate, destroyed by the garrison to clear the field of fire from the walls. The town of Newcastle has had varying numbers of Scottish Covenanter troops stationed outside it (their HQ is at Elswick) since they arrived in February, at which time a demand for surrender of the town was refused. Rather than commit time and effort to a major siege, the Scots then marched south to Sunderland, leaving a small force to watch Newcastle. The main objectives of this campaign were always York and the main Royalist field armies. Since then the Battle of Marston Moor has taken place in Yorkshire (2nd July), which was a massive defeat for the Royalists and in which the Scottish army was heavily involved. 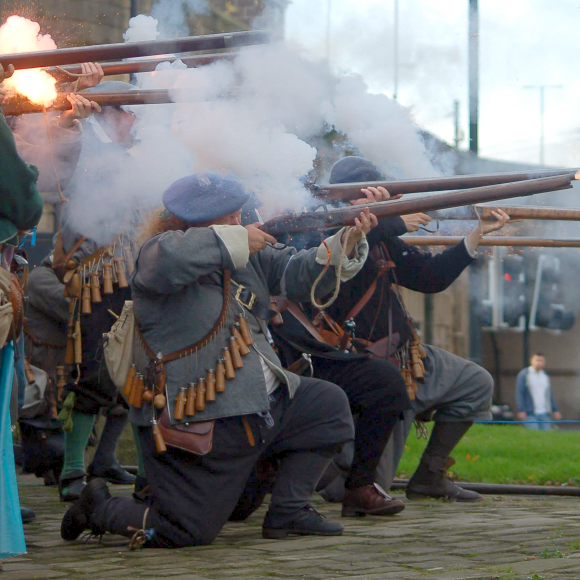 Shortly afterwards the important Royalist city of York surrendered. The King’s situation in the North is now desperate – with the exception of isolated garrisons at Pontefract, Carlisle, Durham, Newcastle and a few other places, there is no prospect of the Royalists re-establishing any significant level of control, thus their focus is increasingly centred on holding the city of Chester, which is an important port on the other side of the country and controls access to North Wales. The great champion of the King’s cause in the North, William Cavendish, Marquis of Newcastle, who almost single-handedly raised and financed the Royalist effort in the North-East, has now gone into exile in Germany, largely as a consequence of Prince Rupert’s having successfully shifted the blame for Marston Moor onto his shoulders. He and almost all his field army are lost to the Royalist effort – a major blow. 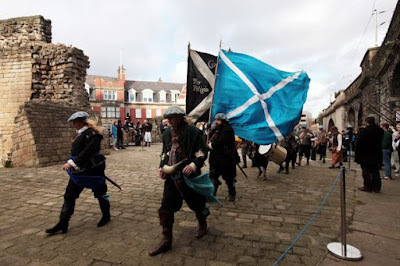 The Scottish troops, under Lord Leven, have now returned to finish the business at Newcastle itself. Apart from its role as the last major Royalist port in the North-East, Newcastle is an essential supplier of coal to Parliamentarian London – restoration of the London coal supply is seen as the main deliverable from capture of the town, and Leven is now under a lot of political pressure to take the place, and quickly. The situation in Newcastle is now critical – though an effort has been made to collect supplies into the town, the arrival of a fresh Scottish force under the Earl of Callander resulted in the capture of the town of Gateshead (27th July), on the other end of the only bridge over the Tyne, and of the fort at South Shields, at the mouth of the river, so that the town is now cut off from the outside world for the first time – prior to this, despite a supposed Parliamentary blockade, some ships had been taking coal to Rotterdam and Hamburg, and returning with provisions and armaments. Leven arrived back at Elswick from Yorkshire on 15th August with his main army – the Scots have now constructed pontoon bridges across the Tyne both upstream and downstream from Newcastle, and hold the south bank of the Tyne – the port and castle can now be fired on from across the river. They have troops and guns all around the town. There has been an extended exchange of diplomatic letters between Leven and Sir John Marley, who is both Mayor and Military Governor of Newcastle. Leven has been urging for speedy surrender, to avoid unnecessary loss of life (and to protect the coal supply! ), and Marley has deliberately been prevaricating and nitpicking over the protocols under which terms should be agreed, and about whose fault it will be if bloodshed does occur. Marley’s obvious aim is to play for as much time as possible, which seems odd since there is no chance of being rescued by any kind of relieving force. Leven is known to be subject to much criticism in London for what is perceived as a dilatory and otherwise unsatisfactory showing at Newcastle. There is also a widespread feeling that, after a long and illustrious military career, he is now too old for the stresses of campaigning - even his most loyal colleagues fear this may be true. Throughout the protracted game-playing of Marley’s supposed negotiations for terms of surrender, Leven has intermittently carried out some limited bombardment of the town, but it seems to have been more to emphasise his overwhelming advantage than to destroy the place out of hand. Leven has a total force of perhaps 20,000 soldiers, stationed on both sides of the Tyne and all around the walls of Newcastle. The obvious site for batteries to breach the walls is on the ridge at The Leazes, which faces the medieval town wall between Newgate and Pilgrim Street Gate. The walls of the town have been repaired, but they are of an archaic style which predates siege artillery, and there are no earthworks to protect or support them against roundshot. The Contesse has been sorting out her folders of photos, and she found this rather scary exhibit - I never knew such a picture had been taken, though I shall be on my guard in future. Apparently this was almost exactly three years ago - obviously on a dark and stormy night. In the intervening period, both the sofa and my sweater have gone to the landfill, it seems (you can see why), but the fierce concentration and the Silence of the Lambs magnifying "jeweller's loop" (which I occasionally wear when answering the door, just to frighten the mailman) are still very much in evidence. I had a half-hearted attempt to see if I could work out what I was painting, but didn't get very far. As you can probably see, one of the difficulties I have in painting is that my nose is too long to allow me to get close enough to the job. As you can also see, one of the advantages of this hobby is that you don't always have to look your best. I'm sure that's right, but I am still a bit upset - this is the first clue I've had that I don't look like Brad Pitt. I'll have to get the hang of this.